Gemini Observatory has received a multi-million dollar award from the National Science Foundation to advance our leadership in the era of Multi-Messenger Astronomy. 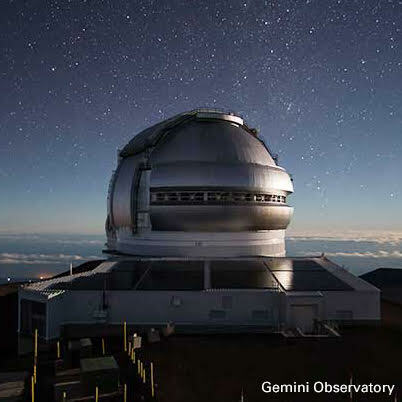 The Gemini in the Era of Multi-Messenger Astronomy (GEMMA) program funded by this award will focus on the areas of high spatial resolution and rapid-response astronomy. Hence, we are in the early stages of designing and building a next-generation adaptive optics system for Gemini North (GNAO). This will be a laser-assisted, multi-conjugate adaptive optics system inspired by the GeMS system at Gemini South. It is intended as a general purpose system for both imaging and spectroscopic instrumentation and will be available for both facility and visiting instruments. The system will utilize a combination of laser and natural guide stars to provide an essentially uniform correction across a field of view approximately two arcmin in diameter. We expect the first light instrument to be an imager. The timeline for the GNAO project is to have a conceptual design review late in 2019 with first light in 2024. This ambitious timeline requires a rather streamlined process; in particular it requires us to establish the scientific requirements early on, well before the conceptual design review. To this end we are soliciting input from you, our community of users. Input by the end of February would be the most helpful. Please see the GEMMA web page to learn more and share you ideas and science requirements. Head of the Science User Support Dept.